Biophotonics for Medical Applications presents information on the interface between laser optics and cell biology/medicine. The book discusses the development and application of photonic techniques that aid the diagnosis and therapeutics of biological tissues in both healthy and diseased states. 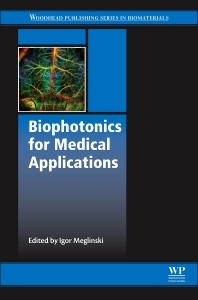 Chapters cover the fundamental technologies used in biophotonics and a wide range of therapeutic and diagnostic applications. Associate Professor Igor Meglinski is a Head of Bio-Photonics and Biomedical Imaging at the Department of Physics, University of Otago, a Fellow of the Institute of Physics and the Node Leader in Biophotonics4Life Worldwide Consortium (BP4L).